Thursday's Bugatti vs. McLaren debate was fun, no? The McLaren handily won, garnering just over 65% of the vote. And I don't think anyone is too shocked by that result. Given the choice between pre-meltdown Jenna Jameson and Taylor Rain, the true connoisseur chooses Miss Rain. Every time. Ahem. Today we're presenting you the two other hypercars to scream at each other over debate and discuss. 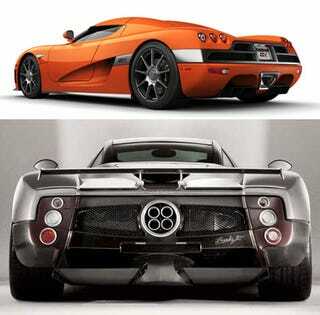 We think the Koenigsegg is better looking and we know it's faster. Still, the Pagani simply screams ultra-exotic and really does seem to have been designed by an alien race. Other than that, I mean, yeah... how do you decide? It'd be like choosing between Sophie Evans and Jenna Haze. Bugatti Veyron 16.4 or McLaren F1?